World Cup Play-offs: Algeria vs Burkina Faso! Ouagadougou was perfect. The bedlam checked all the ticks necessary for an African World Cup Qualifier. Jonathan Pitroipa played that talismanic role with the ease legendary players do. Aristide Bancé toyed with the razor sharp threshold between sanity and courage when dispatching a penalty kick after already missing one at the end of the first half. Algeria, as the visiting side, did not rest on their laurels, but repeatedly left their metaphorical shell and hit the Burkinabe defence with precise, rib-crunching body-shots. Even Zambian referee Janny Sikazwe got in on the act when controversially awarding King Aristide a second crack at M’Bolhi from 12 yards out. In the end the Black Stallions copped a valuable victory, but the Algerians took solace in their two away goals. Adding to the Algerians’ confidence is the fortress that is Mustapha Tchaker in Blida. Algeria have never lost a game in Blida, winning 17 of 21 matches there albeit Burkina Faso were one of the teams that drew in 2004 in a friendly match nearly a decade ago. Algeria’s record in World Cup Qualifiers in Blida is equally as impressive. Nine wins in nine matches and outscoring opponents 22-5. Pitroipa and co. will have a monumental task ahead of them Tuesday night, but no one can doubt their credentials if Burkina Faso pass this last seemingly insurmountable hurdle. Mitigating the gravity of such a feat is the return of Alain Traore. The man who dons the orange of FC Lorient has only just come back from a long-term injury and he only clocked 77 minutes before this crucial fixture. He is expected to play a part in Paul Put’s strategy, but not from the get-go. 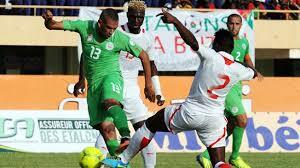 What Traore will add is a set-piece threat which can destabilize a usually resolute Algerian defence. Paul Put is expected to return to his familiar 4-3-2-1 with Kabore sitting deeper, flanked by the muscular Rouamba and marauding D. Kone. That midfield shield should shore up some of the defensive lapses Les Etalons suffered in Ouagadougou. Nakoulma and Pitroipa will animate play behind the great Aristide Bancé. Nakoulma has a knack for scoring the important goal, a trait that had him dubbed, ‘The Burkinabe Leon Osman’ by SFG. Pitroipa is more concerned with wreaking havoc than the neat sciences of scoring and assisting. Balima takes Koffi’s place after the latter was hit with a suspension. Coach Vahid was hit a few suspensions of his own. Watford defender Essaid Belkalem and Adlene Guedioura both amassed too many bookings and will, therefore, sit this one out. Medjani should logically move in central defence and Mehdi Mostefa also finds his natural position in defensive midfield. Medhi Lacen was, perhaps surprisingly, preferred to Saphir Taider to deputize for Faouzi Ghoulam’s forays forward. The front three remain untouched and will shoulder the scoring burden for Les Fennecs.